In 2008, famed anime director Mamoru Oshii premiered his film, The Sky Crawlers, to the world. 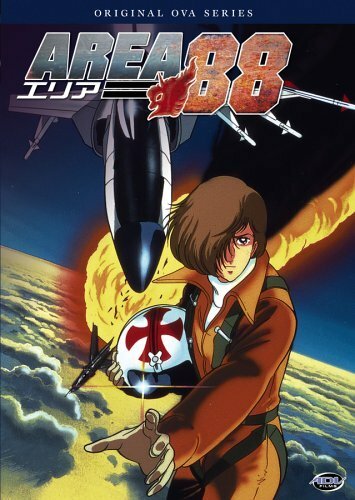 One of the main draws of The Sky Crawlers was its focus around characters whose job was to fly planes and engage in dogfights with other pilots. Audiences were taken aback by its fluid displays of aerial dog fighting and tactical combat. 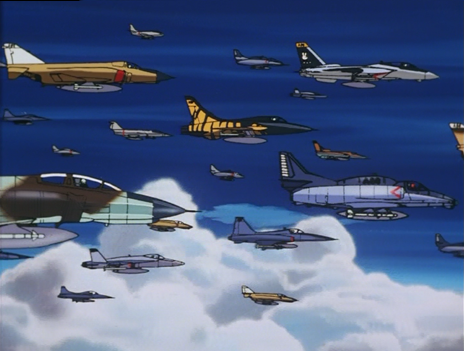 This got me thinking; there seems to be a dearth of airplane fighting in anime. Now I know what you are thinking, “But what about the Valkyrie from Macross?” Well, the Valkyrie were mecha that transformed to fight the Zentradi. No, I am talking about real plane-to-plane combat. So to fill that need, tonight I will be reviewing a classic anime about just such a topic; the 1985, three-part OVA, Area 88. Area 88 was directed by Hisayuki Toriumi, director of the Alien-esk Lily C.A.T. and the Gatchaman movie. The most interesting aspect of Area 88’s production stems from its character designer, Toshiyasu Okada. Toshiyuki Okada’s use of big eighties hair can be tracked back to some of his other credits; including The Mysterious Cities of Gold and the Mamoru Oshii directed OVA Dallos, considered one of the original OVA series (impressed by how I was able to tie this back to Mamoru Oshii). Placed during the late 70’s and early 80’s, our hero, ace fighter pilot Shin Kazama, struggles on the military air base Area 88. Together with comrades like Mickey Simon and Greg Gates, Shin must serve in the fictional country of Aslan’s Foreign Legion under Lieutenant Colonel Saki Vashtar. Area 88’s inhabitants are foreign mercenary pilots brought in to combat the Anti-Government Regime that plans on overtaking the government. Each new fighter on the base is only able to leave under one of three conditions: last three full years, raise up to 1.5 million dollars, or desert. The job is simple, fly out on missions to combat and kill the enemy forces, something that Shin has a problem with morally unlike the military elite around him. As usual with mercenaries, many of the men are here voluntarily; a decision never offered to Shin. Now flashback a few years and we see Shin working to become a pilot for Yamato Airlines. Since childhood he has being working at this with his friend Satoru Kanzaki. He is finishing his training in Paris and is considering marrying his girlfriend Ryoko Tsugumo, the daughter of the head CEO of Yamato Airlines, when he finishes. But while celebrating with Kanzaki over completing their training, Kanzaki tricks a drunken partying Shin into signing up for military service. 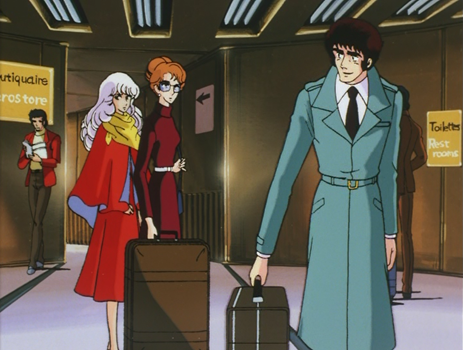 Kanzaki being envious of Shin’s future opportunity lets Shin be taken away by armed men, leaving Kanzaki to take his place as a pilot for the Yamato Airlines. Area 88 was originally based on Kaoru Shintani’s twenty-three volume manga. Interestingly enough, Kaouru Shintani’s original manga has a storied history with the American audience. It has been said that Area 88 was one of the first manga series to come out in the States, right after Barefoot Gen and Lone Wolf and Cub. Area 88 spawned an Arcade and SNES game that saw an American release back in 1991 under the title of U.N. Squadron and an Area 88 remake T.V. series adaptation in 2004. Emanating from my speakers came Area 88’s tremendous score. The introduction features the song, “How Far to Paradise”, performed in English by Derek Jackson. See, back in the eighties, it was cool to have English lyrics in your anime. Now, that is still true today, but not even close enough to how it was back then. Eighties rock, heavy with synthesizer and light ballets are layered over plane explosions and upside down camera shots. I whole heartily suggest sitting down and listening to the soundtrack on its own. Pros: Excels at a story while juggling engaging action scenes. The fantastic soundtrack brings added passion to the intense dog fighting. 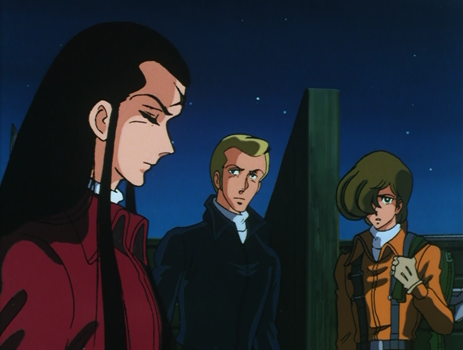 The romance between Shin and Ryoko is played dramatically, but is not a detriment to the story. The planes are animated in nice and clean detail. Cons: The melodrama will not work for some viewers. The story tends to have some unbelievable coincidences, to an almost comedic level. Instead of calling Area 88 a three episode OVA, I would almost call them two individual ninety minute movies. The reason I bring this up is I feel the first two episodes are not broken up; leaving one long stretching plot that tends to kill off characters faster than they can introduce them. Revisiting Area 88 was like a breath of fresh air. It still astounds me that something this good could sneak under the radar of the modern viewer. Shin’s journey to survive is just as compelling now as it was back when I originally watched it. ADV films brought this out as a rerelease a few years ago, so the entire three-hour investment will not set your wallet back. It is a shame that more people do not talk about Area 88, for this is truly a classic anime that you need to experience.